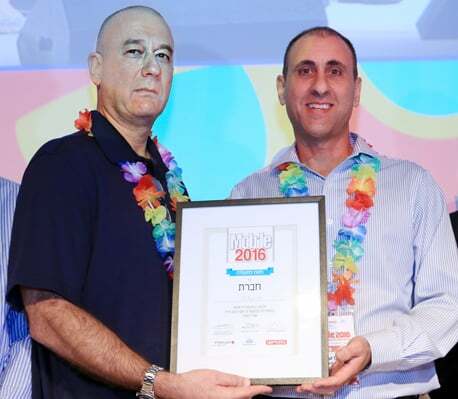 PetPace’s CEO Avi Menkes and Chief Veterinary Scientist Dr. Asaf Dagan accept the award for Israel’s most promising startup. PetPace, the provider of an innovative IoT collar for remote real-time monitoring and analysis of pet vital signs and activity, today announced that it had been named Israel’s Most Promising Startup. The company was chosen from more than 150 other startup companies in the fifth annual competition, which is sponsored by prominent Israeli business daily Calcalist, together with Israel Export Institute and Israel’s largest commercial bank, Bank HaPoalim. Designed for use on dogs and cats, the PetPace collar uses non-invasive sensors to accurately and continuously monitor temperature, pulse, respiration, activity levels, positions, calories and more throughout the day. The data, accessible to pet owners and veterinarians via smartphone and web applications, is continuously analyzed by a cloud-based analytics engine that examines individual, historical and breed-specific attributes. If the collar detects any abnormalities, an alert is sent in real-time to owners and veterinarians, allowing for prompt attention and treatment of the issue. PetPace was founded in 2012 by Mr. Avner Schneur, the head of the US-based Kormeli technology investment group; Mr. Avi Menkes, serial entrepreneur and previously CEO of RFID startup SandLinks, and Dr. Asaf Dagan, an experienced veterinarian and a Diplomate of the American Board of Veterinary Practitioners (ABVP), specializing in Canine and Feline medicine. PetPace continues the tradition of innovation in Israel, the startup nation. Technology originating in Israel is today found in almost every business and home in the Western world. The Internet Firewall, modern cellular billing, voicemail, VoIP telephony, and instant messaging – all these were conceived and developed in Israel, and the country continues to strengthen its position as a world technology powerhouse. PetPace was chosen by a panel of well-known judges representing some of Israel’s most respected technology and financial leaders. As the winner of the Most Promising Startup award, PetPace will represent the Israeli technology community in the Israel Export Institute’s booth at the upcoming 2016 Mobile World Congress in Barcelona. We are honored and humbled to have been chosen as this year’s most promising startup, said Avi Menkes, founder and CEO of PetPace. Beyond the market validation that this award provides our hard-working team, we look forward to the new business opportunities it will undoubtedly provide, he continued. PetPace was founded in 2012 to bring peace of mind to pet owners and prevent unnecessary pain and suffering for dogs and cats through improved pet health and quality of life. PetPace specializes in the remote monitoring of pet vital signs by utilizing advanced analytical methods and alerting models. The company’s low power, wireless collar is fitted with an array of sensors that report abnormal vital signs within established physiological and behavioral parameters. Once an abnormal sign or behavior is detected, a sophisticated cloud-based analytical engine evaluates the signs and if needed, sends an immediate alert regarding any suspected condition. This allows the owner or the vet to take preemptive action to protect the pet’s health. For more information about PetPace real-time pet health monitoring, visit https://petpace.com.